Turkish Airlines has its Valentine’s Day 1 Euro companion fare offer back. One passenger needs to buy a “full fare” ticket and the companion can fly on just one euro. This offer is valid for travel between February 9 to 15, 2014, and must be ticketed by at least 7 days before intended travel. The maximum stay under this fare is 8 days. The terms and conditions state that the second guest won’t earn anything for his/her ticket, but I believe that this has not been case in the past (for those that have not been crediting to Miles&Smiles). You cannot purchase this fare online, but you need to contact Turkish Airways by phone or visit one of their CTO’s. Note that these trips must originate from Istanbul, Ankara or Izmir. You can access this offer on TK’s website here. Turkish has had some very attractive offers under this Valentine’s fare offer in the past. I have not time to contact TK to inquiry about their prices this time around. The promotion is only available for tickets purchased via our call center or sales offices. This promotion is only available to Miles&Smiles members. However, the second passenger in the PNR (passenger name record) is not required to be a Miles&Smiles member. 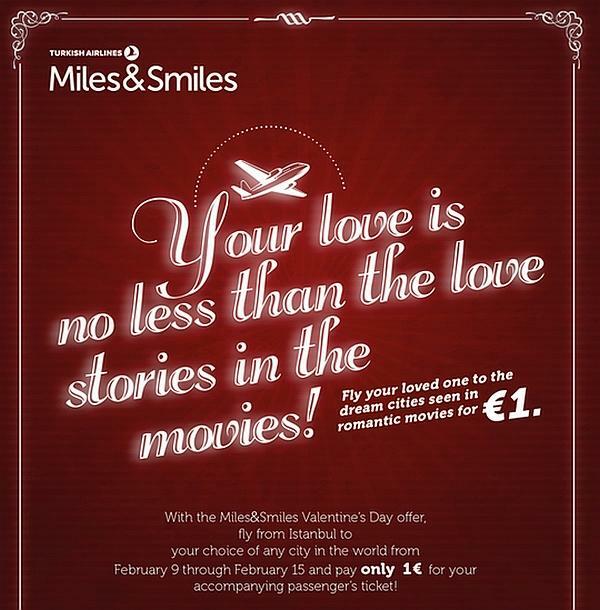 One of the passengers must purchase a full price ticket, the Valentine’s Day special price, while the other pays only €1. For flights out of Ankara and Izmir; 50 EUR/RT add-on will be applied for each ticket. This promotion is only valid for RT (round trip) and OJ (open-jaw) tickets. Passengers are obliged to travel together for all destination. Mileage accrual is not possible for promotional 1 Euro ticket, but the other full fare promotional ticket is eligible for mileage accrual. Tickets must be issued within 24 hours of a reservation being made. The ticketing procedure should be completed at least 7 days before flying. Dates and routes of the tickets cannot be changed. Tickets are non-upgradeable and non-refundable. This promotion is not applicable on codeshare flights. This promotion will be valid for the predetermined routes, conditions, specific prices and quotas. Miles&Smiles membership card number should be presented at the time of purchase.